Backyard Beekeeping is an interest that I haven’t written about very much here on this site but I’ve continued at it since that initial backyard beekeeping post back in 2011. There’s been a lot of progress out in the Veggie Gardening Tips Apiary and this entry is a complete update on the beehives and my latest beekeeping activities. I went into last winter with a total of five honeybee colonies; two full-sized top bar hives, one langstroth hive, one top bar nucleus hive, and one langstroth nucleus beehive. If you’re not familiar with a nucleus (or nuc for short) hive, it is simply a fully functional but smaller colony of bees that is often used as a way for backyard beekeepers to propagate new honeybee colonies. Winter is a critical time for the bee colony’s survival and many of them don’t make it through to see the warmth of spring, but I was fortunate and all of my bee colonies, including the nucs, survived the winter. 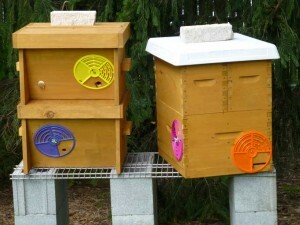 I used the lang nuc to establish a new hive and sold the extra top bar hive to another beekeeper. I didn’t expect to generate any revenues from my backyard beekeeping hobby but the bees in the top bar hives had other ideas; they were so productive that I found myself making and selling nucs throughout the spring and discovered that there was a steady demand for them because commercial sources of bee packages were delayed and supplies of local nucs were scarce and difficult to come by. At times it isn’t easy to part with bees that you’ve raised and watched develop, and more than once I’ve looked at a new queen and observed how healthy and fertile she was and became tempted to tell a prospective buyer no way; that I had changed my mind, and that I wanted to keep that queen and her colony. 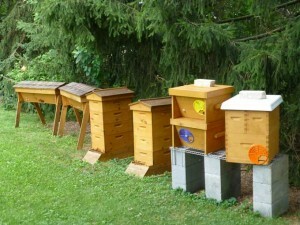 But on the other hand I realized that you can only keep so many beehives in your backyard! Up until this season I hadn’t attempted to harvest anything in the way of a honey harvest; everything was left for the bees or used to expand the number of colonies in the apiary. This year was different and I had hopes that the bees would produce enough that I could share in their harvest for a change. 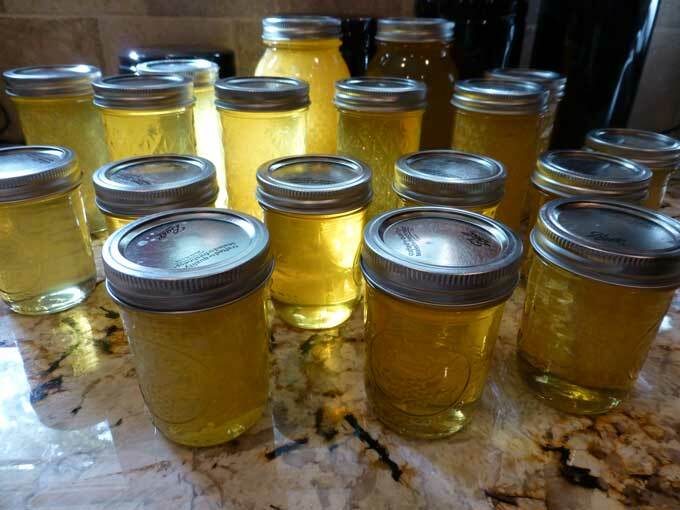 They came through and so far I’ve cut out bars of comb honey and extracted jars of pure honey that I was able to share with family, friends, and of course my neighbors. While the top bar hives have excelled at making comb and baby bees, it’s the langstroth hives that have paid off in terms of the sweet satisfaction of honey production. It isn’t that I haven’t harvested any honey from the top bar hives also, but so far it has been easier for me to manage the nectar that the bees process and turn into honey from the langstroth beehives. Overall that isn’t a bad arrangement for backyard beekeeping to build an increase (of bees) from the top bar hives and honey from the langs! My backyard beekeeping activities settled down a bit after the main nectar flow here in Central PA slowed down and the bees will have less nectar to gather and process until the fall flow begins. I continued with making periodic inspections to ensure that the colonies are all queen-right, watched out for problems with pests like small hive beetles and wax moths, and ensured that the bees had enough food resources to survive the summer dearth. 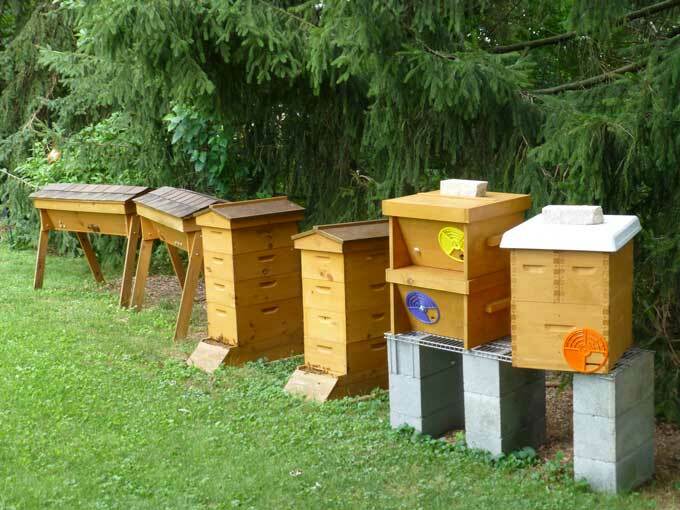 Another nuc was sold during mid-summer and then I began building up the nucs that I plan to over winter as insurance against potential hive losses, or to sell in springtime if once again all of my hives come through winter in good condition. 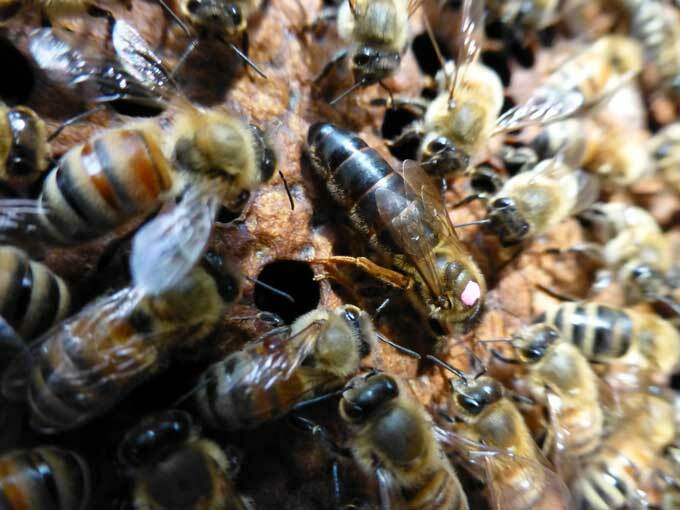 I also re-queened a couple of my colonies in order to introduce younger queens and increase genetic diversity within the bee yard. Other summer backyard beekeeping activities included trying out a pollen trap to gather some bee pollen and setting up a propolis trap to collect some of that sticky material for use in tinctures, extracts, or salves. There are also plenty of wax cappings to render and devise a good use for. I attended the EAS Beekeeping Conference which was held nearby in West Chester, PA a couple weeks ago and picked up some new ideas and made some new beekeeping friends in the process. Depending on the weather and fall plant growth maybe there will even be enough additional honey gathered to provide for a small fall harvest without jeopardizing the stores that the bees need in order to make it through the winter months. I’m considering searching for another location in the area where I can place hives in order to expand just a little. Honeybees remain in crises, and commercial beekeepers are still struggling to keep their hives safe from things like CCD, mites, and strange viruses, but small scale and backyard beekeeping is gaining today in popularity and maybe even in its importance for the well-being of these fascinating creatures. My cousin knows backyard beekeeping but unfortunately, the bees didn’t survive the winter. Perhaps he made a mistake in choosing the best bees with respect to the environment and incoming weather. Anyway, thanks for sharing this article. I’ve been thinking about backyard beekeeping lately. I’ve always had a fear of bees…just a fear, not actually allergic. But, I want to do my part to help save the bees and maybe enjoy a bit of honey! Is there a specific ratio when it comes to the amount of bees you have to garden size? I agree with Janet. Good, informative post. Our bees have puzzled me this year. They seem healthy and active but haven’t produced enough honey for us to extract any. Meanwhile my beekeeping neigbors are getting great returns. I can’t figure it out. Those interested in organic, sustainable gardening should to look into native pollinators. They’re typically non-aggressive and already acclimated to your locale. Everwoodfarm.com, Crownbees.com and the Xerces.org have a wealth of information on how to keep native bees and other native pollinators. I for one am in awe of what native bees can do, and certainly don’t mind buying honey & beeswax candles from another local.